The firmware update below is intended only for use with the MyDigitalSSD M2X USB 3.1 Gen 2 M.2 PCIe SSD Enclosure Adapter featuring the JMicron JMS583 bridge controller. MyDigitalSSD is not responsible for damages or data loss as a result of other than intended use. This update is not mandatory for use and is intended only to improve MyDigitalSSD M2X adapter compatibility and connectivity. Therefore, it is solely up to the user whether or not to download and apply this update. Remove any SSD from the M2X enclosure. The adapter PCB board must be empty when performing this update. Plug the empty M2X PCB board into a USB port. Run the firmware update program. If your firmware is already up to date, you will see the following window and no further action is needed. Press the update button. Update operation generally takes less than 10 seconds. Unplug the M2X PCB board. Install or reinstall an SSD and enjoy. Right click the windows button in the bottom left, click on 'Device Manager'. Expand the 'Storage controllers' to reveal options. 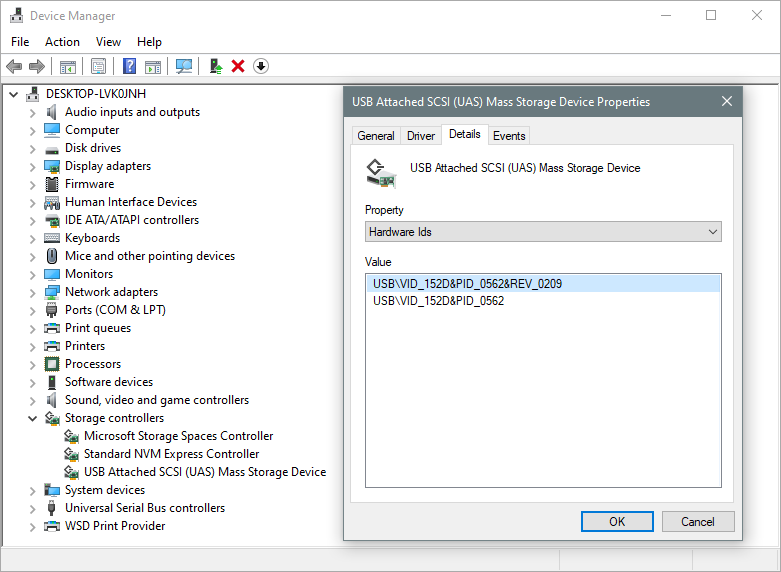 Right click on 'USB Attached SCSI (UAS) Mass Storage Device' and choose 'Properties'. Under 'Property', choose 'Hardware Ids'. Under 'Value', look for 'REV_0205' to confirm a successful update.